Wow, starting from 20th May 2007, the Nuffnang's (What is Nuffnang?) ad will continuously shows up in my blog until 26th May 2007. Take a look for the ad at the end of this post. Hopefully, more advertisers will choose to advertise in my blog after this. Image 1 : Nuffnang ad shows up in my blog. Many of our Nuffnangers have already reached the RM100 threshold and we’ve already been sending out cheques to them. Now it’s nice to have virtual money credited into your blogger accounts and all but all that is worthless until you’re sure you can really cash it out. 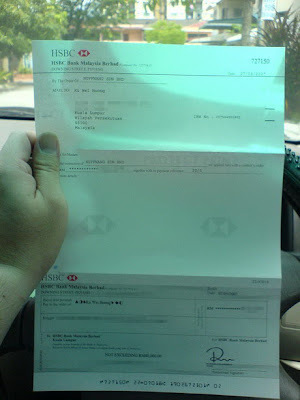 What happens is Nuffnang Sdn Bhd has a tie-in with HSBC Malaysia such that every time a blogger clicks“Pay Me” in the earnings tab, it will go straight into our online system and HSBC will automatically have a cheque sent out to the recipient at the end of the month. The cheques you receive will be computer generated, just like the ones you get from Google’s Adsense. Image 2 : Earl Ku's cheque from Nuffnang.